Clue One Completed! 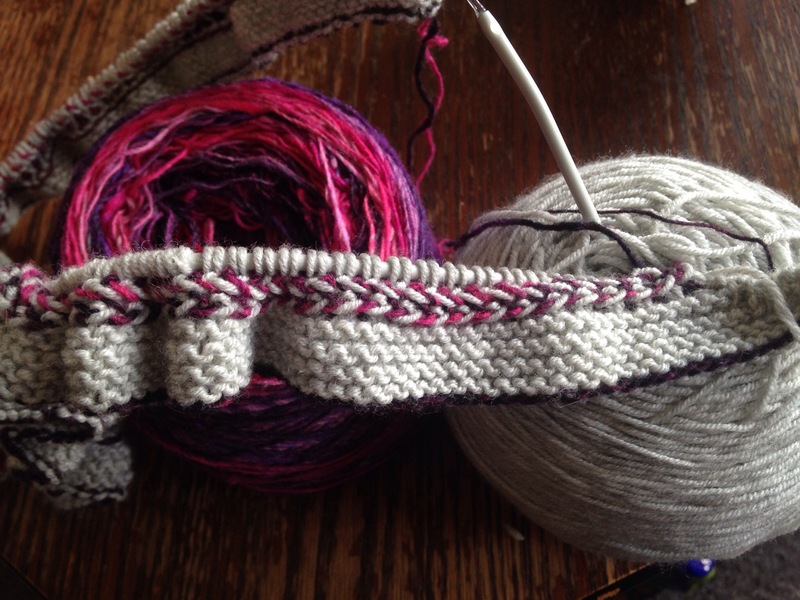 I am loving the look so far, and I’m really pleased with the colour choice, they grey is a nice cool complement to the variegated pinky purples, and I’m sure it’s going to work well together as long as I keep my tension under control. The main ting to watch out for is that the Noro is very curly with little bounce and the Drops Baby Merino is super bouncy. So far though the fluffy property that the baby merino has (which is common in a lot of cheaper merino yarns) actually complements the Noro as I hoped it might. So that’s all good. The Vikkel Braid instructions are a bit confusing. You are directed to an online video and from the webpage, it’s not actually super clear which video you are meant to watch, but the one I watched indicated that you should knit each colour into the same colour from the braid set-up. From reading the KAL thread, I gathered that you are actually meant to knit into the alternating colours. This isn’t clear on the pattern sadly. Also, I was very confused by the colour descriptions, as the pattern refers to MC and CC and also Background Colour, Colour A and Colour B. It’s fairly intuitive, but I do like these things to be really clear in patterns or I worry that I’ve gotten them the wrong way around. All in all, I’m really enjoying the pattern so far, and my niggles are fairly small, bearing in mind that all my questions were answered in the KAL thread. I’m really looking forward to Friday! This entry was posted in Uncategorized and tagged drops, familytreeshawl., handknit, knitting, mkal, noro, shawl. Bookmark the permalink.